Elgato is going to make streaming easy. That’s the impression I get anyway from the new Elgato Stream Deck, revealed this morning. It’s a control center—a block of fifteen programmable LCD keys that integrates with OBS, Twitch, YouTube, Twitter, and more, making the whole process as simple as the push of a button. As seen in the trailer below, you can easily set up buttons to start your stream, tweet about your stream, switch between scenes, and more—including silly stuff like custom sound effect and animation triggers. Elgato claims there’ll be over 200 programmable actions at launch. The tech itself is nothing new. Hell, the Stream Deck’s design looks like it came direct from Razer’s Switchblade interface—black rectangle, rows of LCD keys. We’ve even seen fully-programmable LCD keyboards in the past. But the Stream Deck might succeed where those others failed. Why? Well, a few reasons. First of all, it’s dedicated to a singular purpose, and one that desperately needs streamlining. Setting up a Twitch broadcast is still a weirdly archaic process at times—especially compared to the one-button streaming found on consoles. The Stream Deck looks like it’ll largely automate many tasks, and configuring the device uses a simple drag-and-drop interface. 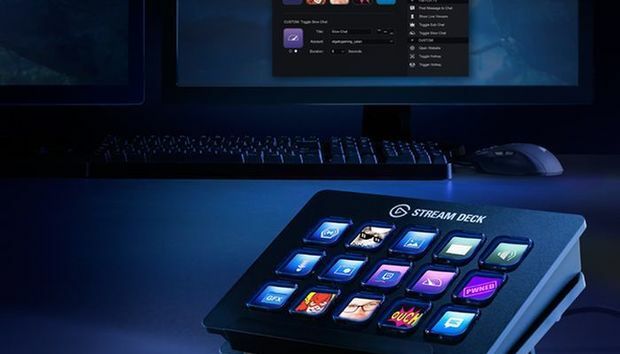 The Elgato Stream Deck and its drag-and-drop control software. Which brings us to price. Elgato’s capture cards are so prevalent not necessarily because they’re the best on offer, but because they provide a professional-grade experience at an entry-level price. The Stream Deck puts a pro-level control center in everyone’s house, more functional and more flexible than higher-priced gear in many cases, and it does so for just $150. Not too bad at all. We’ll hopefully have more concrete impressions of the Stream Deck once it launches in May. Razer’s Switchblade UI never quite lived up to its promise, so it’s only due diligence to make sure Elgato’s Stream Deck does. But for the moment, speaking only of wispy promises and marketing buzz? This little gizmo seems like a lifesaver. The Elgato Stream Deck sitting in its stand, next to a Corsair keyboard.